AMD today announced the availability of its AMD Elite A-Series Accelerated Processing Units (APUs), formerly codenamed Richland. These processors, designed for use in notebook PCs, combine either two or four x86 CPU cores with a graphics engine derived from AMD’s Radeon HD 8000 series of discrete GPUs on the same chip. In a briefing earlier this month, AMD indicated that it had been shipping Elite A-Series APUs since December, and that the components should begin appearing in traditional and performance notebooks later this month. AMD expects to release a low-voltage iteration of Richland APUs for use in ultrathin notebooks later in the first half of 2013. 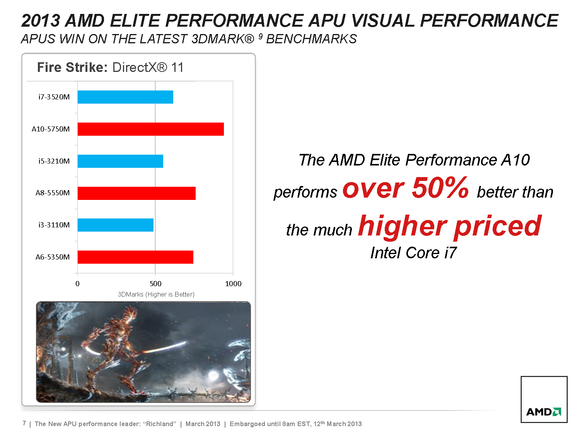 AMD claims that its top-of-the-line Elite A-Series APU outperforms Intel's Core i7 processor lineup. AMD claims its Elite A-Series APUs deliver both higher performance—better graphics performance than an Intel Core i7—and improved battery life compared to its previous-generation APUs. The performance gains, AMD says, will enable an array of new user experiences, such as facial recognition to replace alpha-numeric passwords for security, and gesture control as an easier means of interacting with the PC than using a touchscreen. AMD is bundling several applications with the APUs, so that OEMs can provide the software to end users who buy computers. 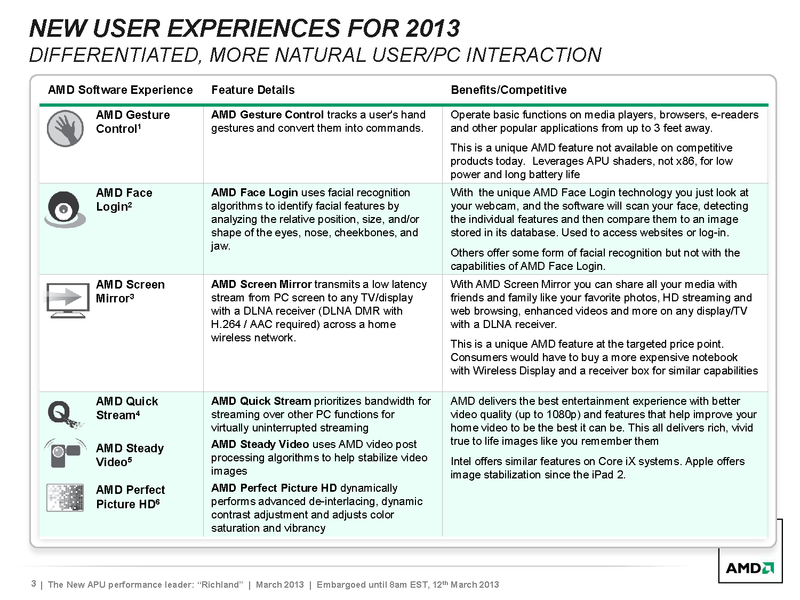 AMD Gesture Control, for example, taps the APU’s graphics cores to recognize hand gestures. Users will be able to operate basic functions on media players, web browsers, e-readers and other applications by moving their hands in front of a web cam from up to three feet away. AMD is providing application software with its new APUs, so that its customers can in turn offer the programs to notebook buyers. Using AMD’s Face Login software, a webcam will capture an image of your face, and an algorithm will analyze your facial features—including the relative position, size, and shape of your eyes, nose, cheekbones, and jaw—to identify your as an authorized user. This could be used to log you into your computer when it powers up or returns from sleep mode, and it could also log you into web applications. In either scenario, presenting your mug to a camera is much easier than trying to remember dozens of complex passwords. Using AMD’s Screen Mirror software, notebook users will be able to stream a notebook’s video across a wireless network to any DLNA-compliant display, so you can play movies, slideshows, and games or surf the web using your HDTV. This is similar to Intel’s WiDi technology, with the key difference being that you don’t need to buy a dedicated receiver to connect to the display. AMD announced four models in the Elite A Series: The A4-5150M provides two CPU cores and 128 Radeon GPU cores (the equivalent of a Radeon HD 8350G). It operates on a base clock rate of 2.7GHz. The A6-5350M is also a dual-core CPU, but its base clock runs at 2.9GHz and it has 192 GPU cores (the equivalent of a Radeon HD8450G). AMD is currently shipping four Elite A-Series APUs, two dual-core chips and two quad-core models. The A8-5550M and the top-of-the-line A10-5750M are both quad-core CPUs. The 2.1GHz A8-5550M delivers 256 GPU cores, while the 2.5GHz A10-5750M provides 384. This model can also support up to DDR3/1866 memory, where the other three APUs top out at DDR3/1600. All four parts have a TDP (thermal design profile) of 35 watts.